In part 1 of this series, we covered stage 1 of Club Entrepreneur--The Lobby. Part 2 discusses the next stage--The Gauntlet. In case you did not determine by the name, this is where things get tougher--when the entrepreneur has their oh sh*t moment. The Gauntlet cannot be avoided, even for those who perform well in The Lobby. The difference is the duration and difficulty. This post will help you avoid the fate of so many who fail here and increase your chances of achieving your objectives. Undisciplined thoughts and emotions can cause the final downfall in this stage, especially for those who expect everyone to love their business as much as mom and dad. In The Lobby, nothing could go wrong, even when they did. In The Gauntlet, the opposite is true. Bouts of extreme highs and lows are common, but the lows are particularly debilitating due more to perceptions than anything else. In most cases, nothing has changed on the ground. The entrepreneur simply becomes a victim of "what ifs" as the imagination and visions of doom run amok. The market appears less interested due in large part to unfair comparisons between the response of well-wishers and those of the target customer. More skeptical and difficult to convince, this group will make you work harder for the sale. Adding to your doubt is the drop in enthusiasm from the well-wishers. Despite all warnings, some refuse to leave The Lobby, returning to the same old crowd of well-wishers. They are eventually forced out of The Lobby and into The Gauntlet because there are not enough easy targets to sustain the business. Unprepared and frightened, they die a quick death. Look no further than those who start MLM (multi-level marketing) businesses. We all know them. They burst out of the gate with the enthusiasm of a kid in a chocolate factory. Weeks later you barely hear from them. Their "sponsor" never explained the need for real sales to real customer. This is a common mistake of the beginning entrepreneur. So where do we start? First, if you just started your business or are about to start, go back and read part 1 of this series. 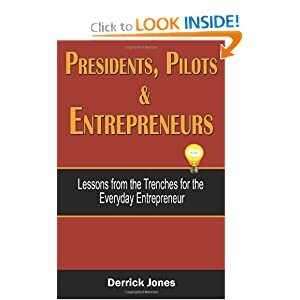 Second, I cover all of this in much greater detail in my book, "Presidents, Pilots & ENTREPRENEURS." If you are impatient like me and don't like waiting for the mail, get the Kindle version and start reading immediately. You do not need a Kindle, just get the FREE Kindle reader application. Go ahead, I'll wait... Now let's get back to business. While trekking through The Gauntlet, keep yourself to a very short list of trusted confidants who can provide guidance and support. Isolation, though tempting, is counterproductive. Be especially careful around those less supportive of your efforts. If you must be in their company (family for instance), keep discussions about your business to a minimum. Do not underestimate the power of negative feedback while in this vulnerable state. Why does Darth Vader suddenly come to mind? Busy work is that which has no real value other than to pass the time. This becomes a bad habit during times of uncertainty. In an attempt to keep our minds off of our worries, we look for anything as a replacement. We should keep ourselves busy, but there are more pressing tasks than cleaning email inboxes and reorganizing file drawers. What should we focus on? Keep reading. The only way to be sure what to keep on your task list is to review your goals and objectives often. Do this at regular intervals throughout the day. Because it is so easy to get distracted in The Gauntlet, this type of review serves as a means of staying on track. Simply ask yourself with each task, "Does this get me closer to my goal or am I just passing time?" Anything that does not meet with the criteria should be discarded without ceremony. For larger, more daunting goals, break them down into smaller pieces that you can work on each day. Entrepreneurs sometimes become too emotionally attached to a product, unable to notice flaws. Perhaps there are ways to improve your offering to make it more appealing. Can a complimentary product help boost sales? What about something as simple as free samples or including a money back guarantee? On the other hand, maybe the original idea is not workable. If any of this were true, wouldn't you want know early enough to make adjustments? Without flexibility, this type of insight is not possible. Some may roll their eyes at this one, but successful entrepreneurs and other high performers swear by it. Spend time each day reliving those moments you overcame insurmountable odds. Many of us fall into a rut while in The Gauntlet, focusing on what is not going well. Yet, we forget the countless times we prevailed under similar or worse circumstances. The same you that strutted with all of the swag of a comic book super hero is the same you slogging your way through The Gauntlet. No matter how the day ends, do not allow your head to hit the pillow without first reliving some of your most victorious moments. Experience them again, tapping into the emotions you felt, the things you saw and the words you heard. The results will amaze you. A classic mistake is to panic and spend time chasing after new business, at the expense of existing customer relationships. All studies show that it is far easier to sell to an existing or previous customer than to acquire a new one. This article from Inc. Magazine explains it well. The customers I refer to, however, are those who meet the criteria of your target or ideal, not the well-wishers. Existing customers play another important role often overlooked. They serve as reminders of what it is like to win. After all, you prospected and convinced this person to purchase from you. If you did it once, twice, three or fifteen times, you can do it again. Conversations with satisfied customers provide a much needed shot in the arm. Sometimes you catch them in a buying mood. They are also a valueable resources for referrals, turning an otherwise cold prospect into a warm one. I know this post may seem a bit gloomy, but it gets better from here. In part 3, we come to the end of The Gauntlet and encounter a fork in the road. Like all things in entrepreneurship and in life, one must choose deliberately or have the choice made for them. Click here for Club Entrepreneur Part 3.